I made this card last summer and it is one of my favorite cards that I have made. When I first saw the Stampin’ Up! Set Inspired by Nature, it immediately reminded me of beach grass on sand dunes. When I was a young adult, I lived in the Florida Panhandle and the sunsets there were magnificent. 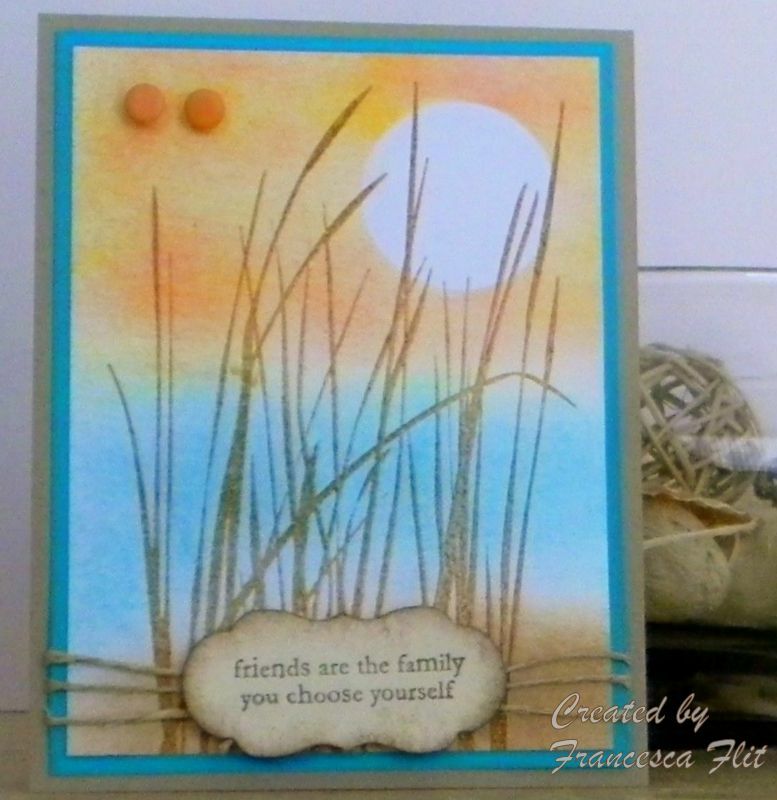 I loved to go down to the beach with a picnic dinner and watch the sun set over the bay and this card was inspired by that time in my life. 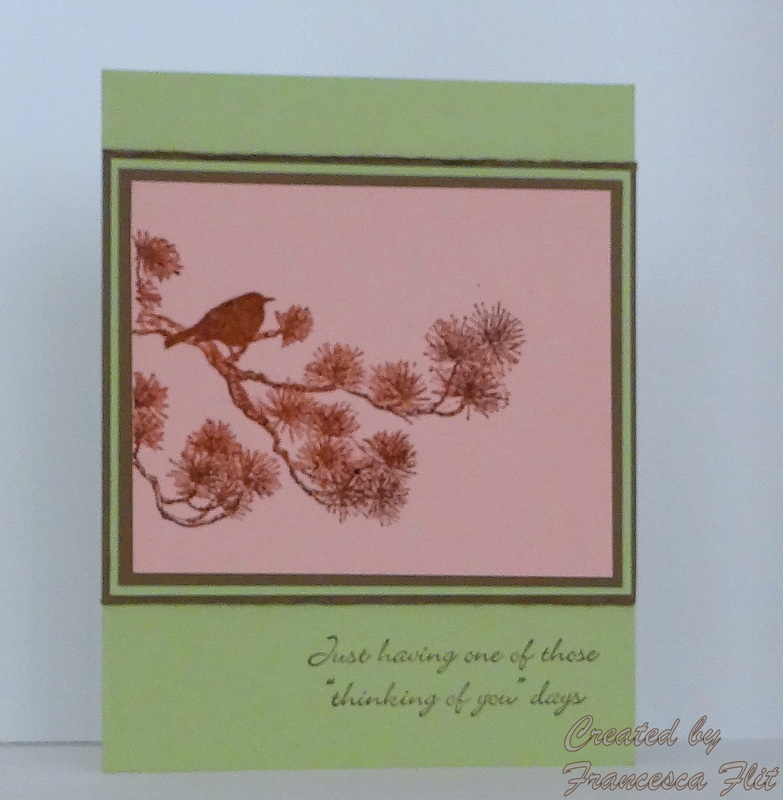 To make this card, I chose Kraft for the card base and Bermuda Bay for the mat. Using Whisper White for the image panel, I masked the sun with a circle punch and sponged the sunset sky with Summer Sun and Pumpkin Pie. I used Bermuda Bay and Baja Breeze for the water and Creamy Caramel for the sand. I stamped the grass first in VersaMark and then in Creamy Caramel and embossed with clear embossing powder. 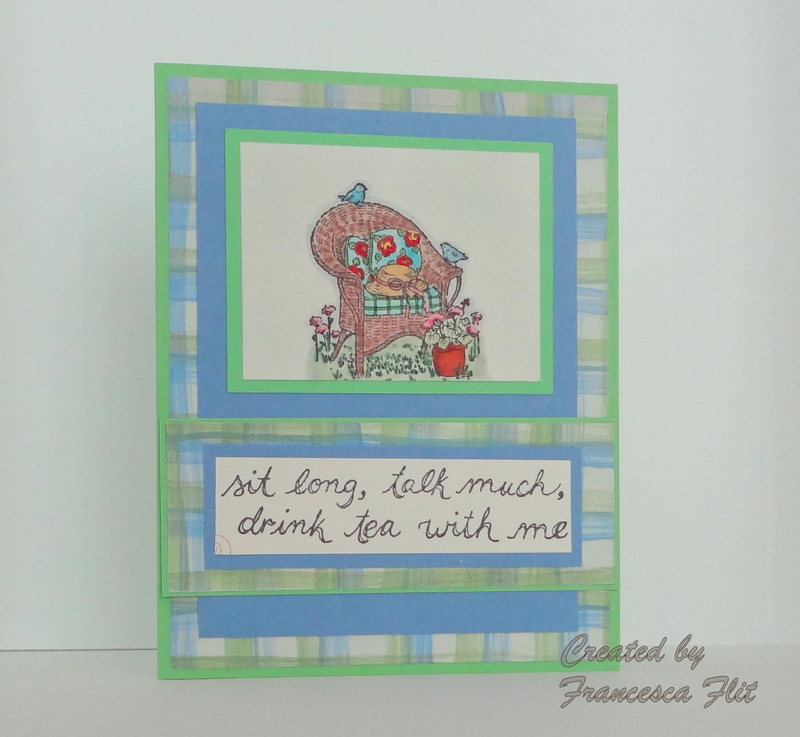 I stamped one of my favorite sentiments on a Stampin’ Up! Labels die cut in Creamy Caramel and sponged the edges. I wrapped the twine around the bottom and mounted the sentiment label on the twine. Today’s Sketch Challenge SC387 on Splitcoaststampers was a tough one for me, I am so not a swirly girl! I was wracking my brain trying to think of what I could use for a swirl and then I remembered the swirl in Stampin’ Up Ocean Commotion. I also wanted to try the Honeycomb Shapes technique featured in this week’s Wednesday Tutorial, so I combined the two on this Christmas card. I love to use nontraditional colors on my Christmas cards. Being in South Florida, I try to infuse a bit of tropical warmth in my Christmas cards, so I chose Bermuda Bay for my card base and mat. 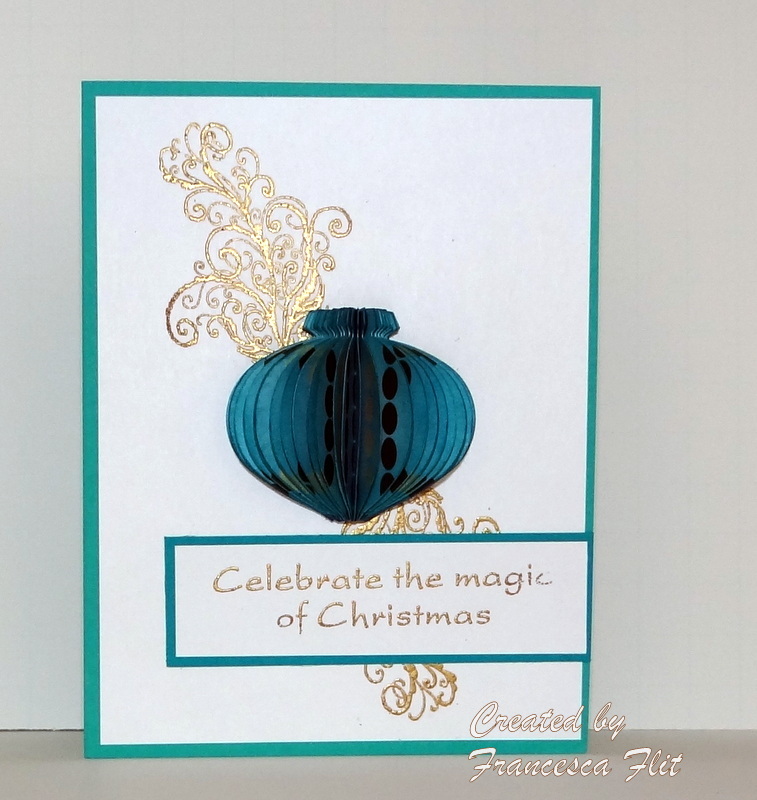 I stamped with VersaMark and embossed the swirl and sentiment with Gold embossing powder. I punched 24 ornaments from an old DCWV Winter Mat Stack. I used Taken with Teal to ink the edges of my punches. Although the tutorial showed to ink the edges after the shapes were glued together, I found it much easier to do before hand. The only thing I would have done differently is to ink the top part of the ornaments in gold. I assembled my punches in groups of 6 and then glued the four stacks together. I found that by making smaller stacks, it was easier to keep the shapes from shifting out of alignment. This is a fun technique and a great way to extend the use of your paper punches! I want to show you this quick little gift bag I made today. It is such a fun and easy project and so versatile! 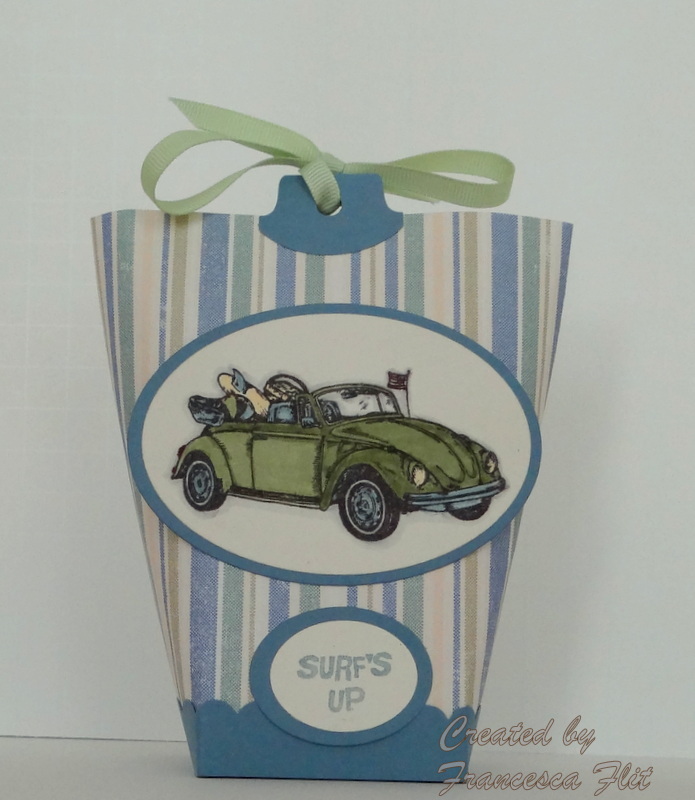 You can find the tutorial for this adorable Box in a Bag on Splitcoaststampers. The VW Bug stamp I used is from PSX and was colored with 3 Stampin’ Up Markers, Bordering Blue, Pear Pizzazz and Barely Banana. The Round Tab and Scallop Border punches are from Stampin’ Up! and the ovals are Nestabilities. The paper is from my stash, no clue where it’s from. Give this cute little bag a try, you will use it again and again! I have a quick and easy one for you today! I made this card for today’s Color Challenge on Splitcoaststampers.com CC377 -CERTAINLY SOFTLY BLUSHING BRIDES, as well as yesterday’s Technique Lovers Challenge TLC379 ~ Distressed Edges ~. You can’t see it very well in the photo but the top and bottom edge of the Soft Suede mat is distressed. Believe it or not, I just got my Stampin’ Up 2010-2012 In Colors on Friday and now I see what all the fuss is about. Blushing Bride really is the loveliest shade of pink! I sure hope it makes it back into a color family someday. For my card, I wanted to emboss the Magenta Pine Bough Perch in Soft Suede on Blushing Bride, so I used the VersaMark with ink technique. I inked the stamp first with VersaMark, then with Soft Suede, and embossed with clear embossing powder. This is one of my favorite embossing techniques, it is so versatile. Just be aware that the color is not as intense with this technique, but you can remedy that by using a Stamp-a-ma-jig to stamp and emboss your image a second time. To finish my card, I triple matted the image with Soft Suede and Certainly Celery cardstock. I mounted on a Certainly Celery card based and stamped the sentiment from Impression Obsession in Soft Suede directly on the card base for a quick and easy card! 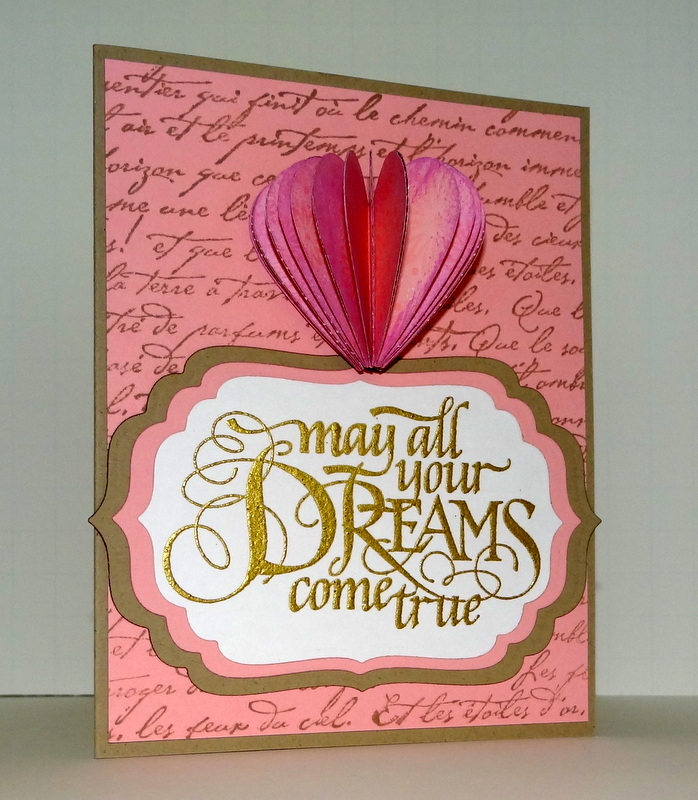 Here is a card I made for today’s Clean & Simple Challenge CAS172- Theme- LOVE on Splitcoaststampers. 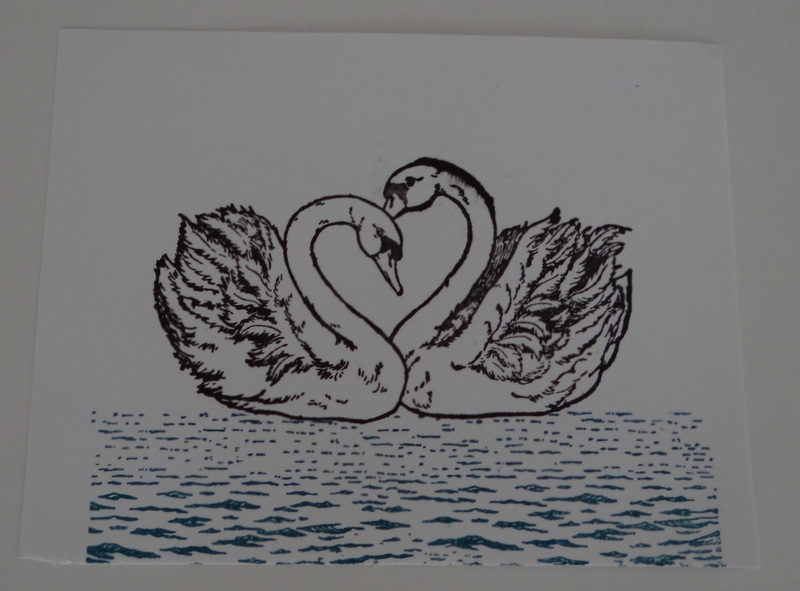 So when I looked at today’s challenge, I knew I wanted to use this PSX Heart Swans stamp. I envisioned using shimmer paint, shimmer paper, glimmer mist, all kinds of fun stuff. And then I remembered my personal challenge that I am doing along with the 100in100 challenge, to use my scraps, leftovers and outtakes. I knew I had a misstamped image of the swans in my scrap bin, so I dug it out to see if it could be salvaged. Well there was no way to save it really, as you can see. 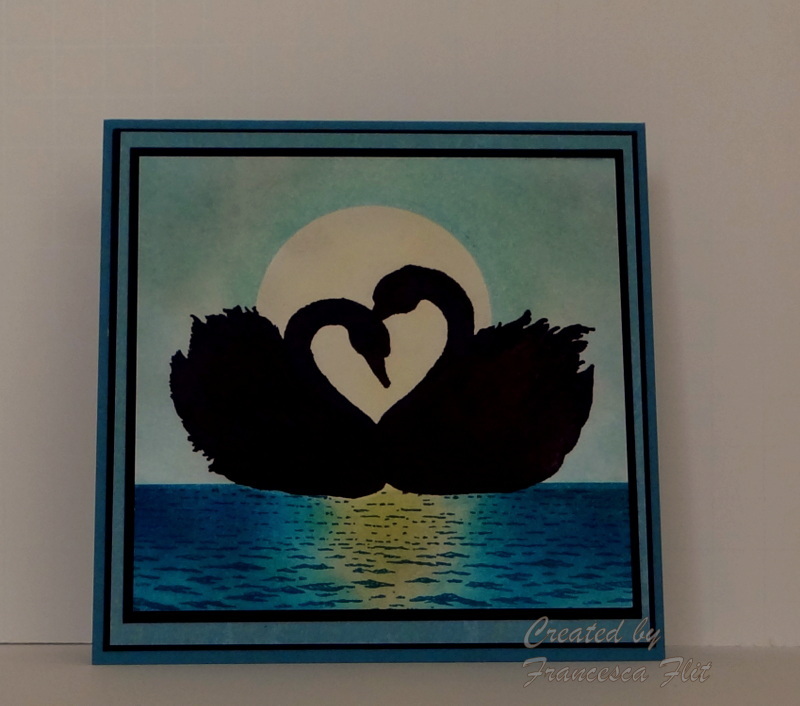 So I tossed it in my recycle box and was reaching for the stamp when the silhouette sailboat card I made the other day caught my eye, and I thought maybe that would work with my misstamped swans image. I figured it was worth a shot! I spent the weekend making cards using scraps, leftovers and unfinished projects for the 100in100 challenge. 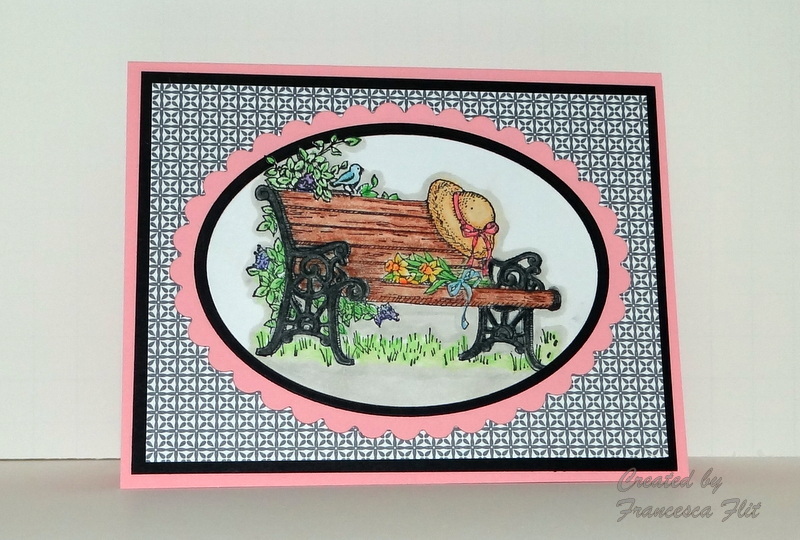 This one was easy because the bench image from Stampin’ Up! 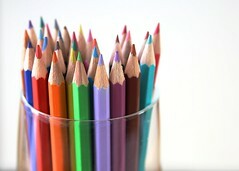 Simple Pleasures was already colored with Prismacolor Pencils. I was going to use it for a Mother’s Day card, but decided on a something different. To finish the card, I stamped the bird in the bush part of the stamp again, colored it, cut it out and adhered it with pop dots. 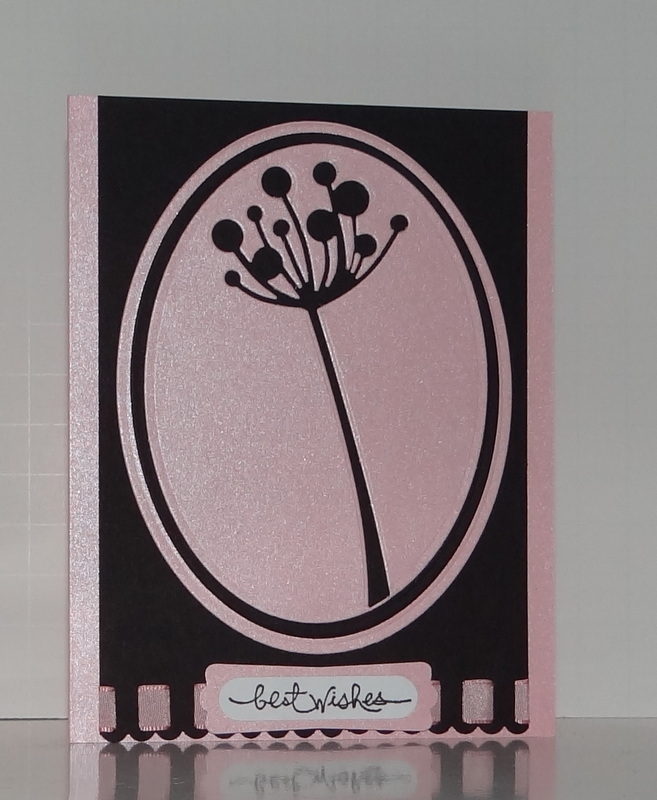 I cut the mats with Nestabilities in Black and Pretty in Pink and used a Stampin’ Up! Print Packs Designer Series Paper in Basic Gray. I matted the whole thing in black and used a Pretty in Pink card base.